The U-T has a “Just Fix it” column you can contact if there is “a problem government hasn’t taken care of despite your complaints.” The column’s writer selects cases and follows up by contacting the appropriate agency and resolving communication issues or other impediments to the solution. Good PR for the U-T although the scope of service is by necessity limited by space and time. I wonder why the U-T or another news organization (or the city, for that matter) doesn’t take advantage of one of the online services that let people easily request 311-type government services, facilitating the process of getting requests routed to the appropriate agency and tracking them for follow-through. Such services allow people to report problems from their mobile devices in addition to their computers and even to include photos in their reports. People can see what else is being reported in their areas and add their “vote” to issues already submitted that they are also concerned about. Take a look at some of these offerings. A website meant to facilitate an international effort to build open interoperable systems that allow citizens to more directly interact with their cities. Having such a system for San Diego could lead to better service, reach new constituents, and facilitate interagency collaboration. Wouldn’t something like this be a handy resource for our community? Apr 12, 2010: O’Reilly Radar just published this review of SeeClickFix. This entry was posted on November 24, 2009 at 12:50 am	and is filed under Government, Internet, Newspapers, Technology. 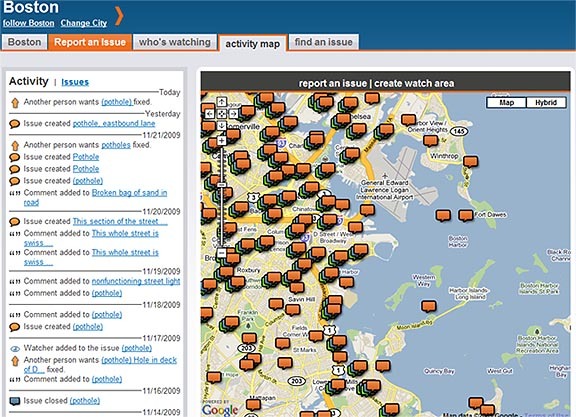 Tagged: 311 services, Crowdsourcing, SeeClickFix. You can follow any responses to this entry through the RSS 2.0 feed. You can leave a response, or trackback from your own site.